This method provides the actual status of the database and is useful to know the period of time covered by SkyBoT. Check now! This method provides the availability of the SkyBoT web-service. Check now! Implementation of SkyBoT which makes it possible to resolve the name of the solar system objects, and to seek for them in any astronomical image (screenshot). You can try it, without any installation process, with the Aladin Java applet. If you have installed Aladin on your computer, you can access to the current release of SkyBoT via the dedicated tab in the server selector. You can also customize your access to SkyBoT by using a special GLU entry. Download the SkyBoT GLU record, save it, adapt it, and restart Aladin with the following argument: aladin -glufile=skybot2.dic. 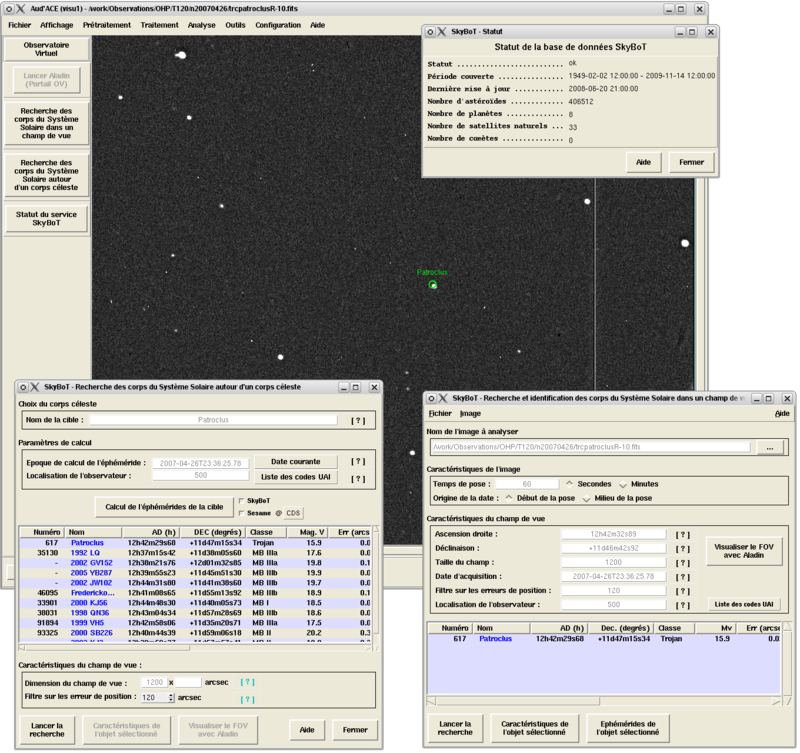 Implementation of SkyBoT which makes it possible to resolve the name of the solar system objects, to seek for them in your own astronomical images, and to point them with your telescope (screenshot). To access the SkytBoT service in Audela, open the "Virtual Observatory" panel. SkyBoT is registered in the various IVOA registries under the ResourceKey: SkyBoT, AuthorityID: ivo://vopdc.obspm/imcce. It can be used through various VO interfaces such as the AstroGrid VO Desktop application, or the NVO VO-CLI command-line tool, and many other VO Explorers. The SkyBoT cone-search method allows one to retrieve all the known solar system objects located in a time-stamped field of view. This may be useful to identify sources in an astronomical image. The SkyBoT resolver method allows one to quickly compute the ephemeris of any solar system objects at a given date. This may be useful to resolve the designation of a solar system object into celestial coordinates, and to quickly know where it is located on the celestial sphere at a given epoch. Information and help about how to use the SkyBoT services are available in the dedicated sections accessible through the portal menu. The SkyBoT service is an XML Web service that lives on the Web. You can access the published methods by making so called SOAP requests, or by using VO applications such as Aladin, Topcat, ... The underlying technology (XML+SOAP+WSDL) being inherently interoperable, you can use them and implement them regardless of what your favourite platform and operating system are. For that, you can freely download toolkits to help you to make the integration of the SkyBoT service seamless with your code. The easiest way to use SkyBoT is to use the Skybot's query forms or to use a non-interactive network downloader (e.g. curl, wget) to send HTTP requests and to receive the result "on your desktop". The SkyBoT service is described in Berthier et al., 2006. The core of SkyBoT is a database of pre-computed ephemeris of all of the known solar system objects (asteroids, planets, natural satellites and comets) over a period which extends from the end of the XIX century (1889-11-13) to the first half of the XXI century (2060-03-21). The ephemerides provided by SkyBoT are J2000 astrometric geocentric or topocentric equatorial coordinates (right ascension and declination) at the requested epoch. SkyBoT provides also J2000 mean heliocentric equatorial rectangular coordinates (position and motion vector) at a specified epoch T0 closed to the requested epoch by less of 10 days. Ephemerides of solar system objects can also be computed for space probes, such as the Hubble Space Telescope, Gaia, and the Spirit Rover. Please contact us if you have a special need that you will like to be implemented into SkyBoT. The right ascension and declination of the targets are computed by numerical integration of the 8 bodies pertubed problem, taking into account relativistic perturbations (post-newtonian approximation). The pre-computed orbits are also calculated with the same algorithm, with a sampling step of 1 day and a storage step in the SkyBoT database of 10 days. The dynamical properties of asteroids are issued from the ASTORB database (Lowell Observatory). The dynamical properties of comets are issued from the IMCCE cometary database. The ephemeris of the planets are computed using the INPOP planetary theory. The ephemeris of the natural satellites are computed using various orbital models, depending on the planetary system. The accuracy of the ephemeris provided by SkyBoT are at the few tens of milli-arcseconds. Depending on the accuracy of asteroid and comet orbits - which depends on the number and the orbital arc spanned by the observations that are fitted - the external accuracy of the ephemeris can be hundreds or thousands of arcseconds in the worst cases. As a consequence, when checking the location of them in astronomical images, it may occur huge errors on the position of some asteroids or comets, especially if they are not accurately known. It will fall within the competence of the user to check and filter the objects before using the data provided by SkyBoT. SkyBoT is powered by a dedicated hardware infrastructure composed of 9 computing elements and 2 storage elements. A master/slave system, composed of 1+6 servers, insures the administration, the monitoring and the update of the SkyBoT database. The SkyBoT services run on two Web servers (each composed of a computing and a storage elements) enhanced by a load balancing and failover solution. The servers operate CentOS 5 Linux distribution. The suite of SkyBoT softwares is written in PHP for the services, and Fortran 95 (using Intel® compiler) and MPICH 2 for the parallelized computation of the ephemerides. The data (pre-computed ephemerides) are stored, processed and secured thanks to a MySQL database engine (MyISAM). The monitoring of the system (hardware and software) is insures by NAGIOS, GANGLIA, and a home made administration/monitoring interface. The SkyBoT database is updated daily to include lately discovered bodies and to update the ephemerides of bodies (mainly asteroids) of which orbits were improved. The hardware infrastructure of SkyBoT allows the service to be available all the time, even when the update process runs. According to the number of asteroids to be updated (few hundreds to a few tens of thousands), you can be brought to wait some time (few hours to two or three days) before being able to access the bodies recently discovered. For comets, the update occurs weekly with the lately discovered objects published by the Minor Planet Center. For planets and natural satellites, the update occurs when new orbital solutions are made available. The SkyBoT service has been designed and developed by the IMCCE (Observatoire de Paris / CNRS) in the framework of the IMCCE Virtual Observatory project (2004-2010). It is supported by the VO-Paris Data Centre and the french VO. The SkyBoT service is hosted on the IMCCE VO Solar system portal, and is accessible through HTTP query methods and a XML+SOAP+WSDL web service. Each response sent back by the SkyBoT service contains a ticket number. This 12 digits number (e.g. 123003240449) identifies each request and may be used to retrieve information on its processing. If you face with errors by using the SkyBoT service (it could occur that no relevant error message is returned), please report us the ticket number corresponding to the problem. It will help us to anderstand and solve it, and you will help us to improve the services. If you are confronted with a bug, or if you would like to request improvements or special needs, please use the IMCCE Mantis Bug Tracker (quick access: use the Report issue menu in the portal menubar). This last point is mandatory because it can easily shift the calculated minor planet position of several arcseconds because of the apparent motion of the bodies on the celestial sphere (from few arcsec per hour to several tens of arcsec per hours for main-belt objects, and more for Near-Earth asteroids). So please, be sure to completely exploit the informations provided by the service (magnitude, error of position, angular velocity, etc). The error of position of ephemerides provided by SkyBoT gives an estimation of the position uncertainty. This error takes into account only the accuracy of the orbit. The errors which are coming from the computation, the model and the reference frame are not taken into account. For asteroids, this error of position is computed on the basis of the parameters CEU (absolute value of the current 1-σ ephemeris uncertainty) and CEUrate (rate of change of CEU) resulting from ASTORB database. In any case, the IMCCE cannot be held for person in charge for a misuse or interpretation of the SkyBoT service. HST observations of solar bodies: SkyBoT is used to seek for solar system bodies which happen to fall in the field of view of any archived Hubble observation (See also Sforna and Micol). Searching for known asteroids in the WFI archive using Astro-WISE: SkyBoT is used to identify asteroids in the ESO Wild Field Imager (WFI) archival images. Universal name resolver: SkyBoT is used to resolve the name of solar system bodies to provide some information needed to generate microformat code of solar system objects. EuroNear Observing tools: archive precovery and recovery: SkyBoT is used to search for all known asteroids imaged in an archive of images or photographic plates. Search and studies of asteroids in the DFBS plates SkyBoT is used to search and identify asteroids in the DFBS plates. The NVO Summer school has made use of SkyBoT in software tutorials providing hands-on experience in using VO tools and services. 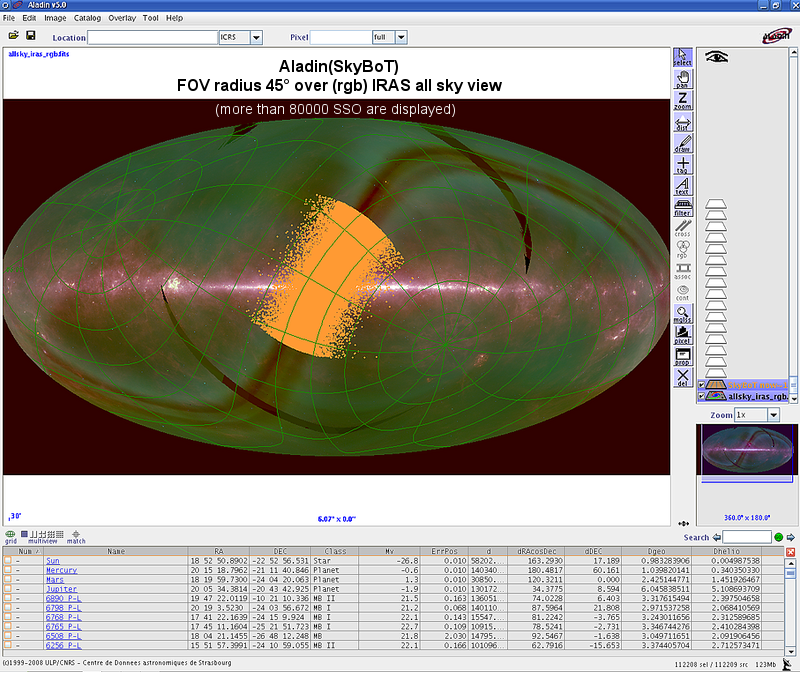 SkyBoT has been used to build, in 2005, a VOEvent table of Nearby Solar System Objects and Variable Stars, and, in 2006, a simple cone search client application with the VOClient package. SkyBoT may be used to model and display the solar system in 3D at a glance. That could be useful to teach the structure of the solar system and to visualize the various classes of asteroids (NEAs, TNOs, Trojans, ...). For that we have developped a specific tool: Skybot3D. It allows you to extract the ephemerides of all the small solar system objects (asteroids and comets) at a given epoch and to display them in an OpenGL rendering context which allows you to navigate freely to visit a snapshot of our interplanetary system. If SkyBoT was helpful for your research work, the following acknowledgment would be appreciated: "This research has made use of IMCCE's SkyBoT VO tool", or cite the following article 2006ASPC..351..367B.